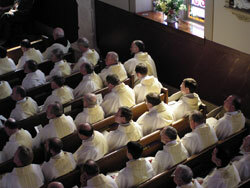 The Office of Clergy and Parish Life Coordinators consists of three departments that work directly with priests, parish life coordinators, seminarians, permanent deacons, candidates for the permanent diaconate, and candidates for the seminary and religious life. These departments work in a collaborative effort to facilitate discernment, create awareness, and assist in education and spiritual development. The office strives to enable, empower, and support these individuals while identifying and providing for the present and future ministerial needs within the archdiocese.